Remember, the x and y coordinates are using Box2D's meters, and should not be pixels on your canvas. You can see the reference to bPolygonShape which is a hint that Box2D can simulate other types of polygons. 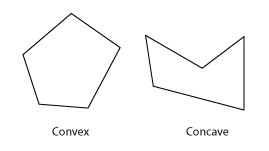 Polygon shapes are solid convex polygons. A polygon is convex when all line segments connecting two points in the interior do not cross any edge of the polygon. Polygons are solid and never hollow. A polygon must have 3 or more vertices. You can simulate a concave polygon by binding together more than one convex polygons, and we'll look at an example of that in another article. Out of the box (pun not intended), Box2D supports polygons with up to eight vertices. Specifying a polygon is harder than specifying a square or rectangle, so kudus to Box2D for providing helper methods for those common cases. The bodyDef still has a position, however with a polygon that position is not considered the center of the object. (This is different than the circle or square, so do be aware of this difference.) The position for a polygon is the point from which the vertices are relative to. For example, a vertex of 0,0 is the same as the x,y position of the polygon. A vertex of 1,1 is one unit to the right and one unit down from the x,y position of the object. 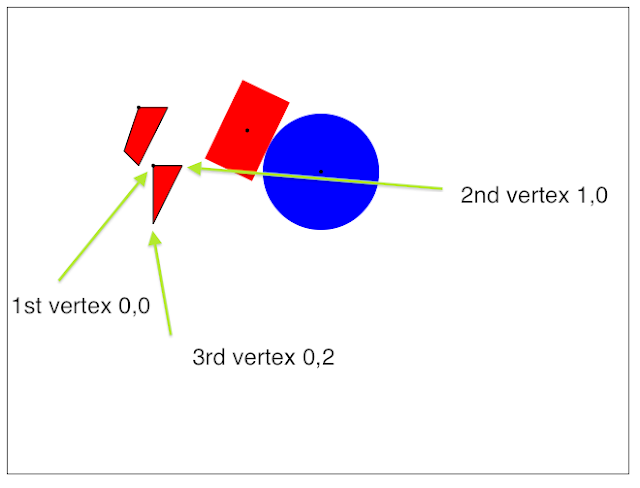 Notice how in the above code, we first moveTo() to the position of the object, and then draw lineTo() to the vertices of the object, and then connect the last vertex to the original position. The only properties of the object that change are the position and the angle, the vertices remain static (as they are essentially offsets from the position). Finding the center of mass for a circle or rectangle in Box2D is easy, as it's just the position (via GetPosition() on the bodyDef.) The position for a polygon is not the center of mass, more like a simple reference point for the vertices of the polygon. Finding the "center" of a polygon requires bodyDef.GetWorldCenter(). You can see a yellow dot for the center of mass of each of the objects in the example below. The embedded example below displays the triangle, with other objects like a circle, rectangle, and a four sides polygon. You can check out the stand alone example for Box2D polygons. The source code is also available. Box2D supports circles and squares and rectangles, as well as more complex polygons. The polygons must be convex, have no more than eight vertices, and the vertices must be specified in a specific order (seemingly clockwise for HTML5 canvas). Next up is how to build and render complex bodies with Box2D, even convex bodies! Please let me know what you think in the comments below. Thanks!